News stories about the South Downs becoming the new Champagne may make good headlines, but how much truth is there really behind the headlines, and beyond that, what effect will climate change really have on the wines we drink? Global warming may not affect your holiday plans for next year, but viticulture is such a long term project that it is essential to study the potential effects on grapevines in good time to plan for the future. Climate change predictions for the next 100 years from the Hadley Centre (see graphs below) include an increase in summer temperature, especially in Europe and North Africa. More frequent extreme weather is predicted, along with altered rainfall patterns; an increase in winter rainfall and decrease in summer rainfall. 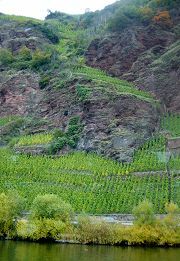 In areas like Germany (right) where steep slope viticulture and thin soils are the norm, erosion could become a severe problem with heavy downpours. One potential solution is to plant cover crops to stabilise the soil surface, but this would also have the effect of increasing water demand. Prof Hans R Schultz at the Geisenheim Research Institute points out that in Germany if you look at old “terroir” maps, the best quality sites are the highest altitude and most exposed. In the future, these may be the sites that face the biggest problems with environmental stress. Early signs of this trend were visible in many parts of drought-stricken Europe in 2003. Vina Grgic in Croatia reported that sites that were normally their best underperformed in this hot vintage, as vines shut down due to stress. Another important aspect of research into climate change is looking at the effect of stress on white vines. Most of the research so far has been done on reds. From a practical point of view, it is easier to study colour changes and experience shows that reds can tolerate and are even enhanced by appropriate stressing. In contrast white varieties seem much more susceptible to stress effects and this may also be a factor in the phenomenon of atypical ageing flavour. Trials at Geisenheim with 2003 vintage showed a reduction in wine quality in wines made from stressed vines, compared to irrigated vines, and accelerated ageing trials made the differences even more significant. Rieslings from the hot 2003 vintage look to have lower ageing potential than 2002 – already developing kerosene-type characters. There are already signs of significant changes in flowering and ripening patterns across the world. At Geisenheim, earlier bud break has been mapped since 1961 and flowering is currently 10 days earlier than the 30 year average. This has implications for spring frost damage in areas like Champagne and Chablis where frost protection is already a major expense. Veraison (the point at which ripening begins) is currently showing as 12 days earlier than the long term average, and research in places as far afield as Bordeaux, Alsace, New Zealand and USA are all showing trends towards earlier harvest. On the face of it this sounds like a good thing, allowing growers to pick ripe grapes ahead of uncertain autumn weather. Inevitably the picture is not so simple, as there are likely to be changes in flavour profile from shorter ripening seasons, an imbalance between tannin and sugar ripeness, and changes in aroma profile as berries will be ripening through hot night temeratures. The suitability of vine varieties for any particular area may have to be re-examined. Varieties like Silvaner, Muller-Thurgau, Pinot Blanc and Pinot Gris have fairly fragile aromatics and are also known to produce ‘off’ flavours linked to stress. Riesling appears to be sturdier (after all it does well in places as hot as the Clare Valley in Australia), but German research is predicting that reds varieties like Merlot and Cabernet will become more suitable choices for the Rhein by 2050. As an example, 2003 in the Rhein region showed a temperature pattern similar to Montpellier in the south of France in a typical year. The Index above is used to predict a grape variety’s ripening capacity and is based on the sunshine hours and temperature during the vegetative period (often described as a heliothermic index). Different varieties vary in their requirements for these factors and hence their suitability for different regions. The chart indicates varietal suitability based on the Index for Geisenheim, Germany so at 1500 Muller-Thurgau is the most suitable grape, 1600 is fine for Riesling, while Cabernet Sauvignon needs over 1900 on the index to ripen, so it is not suitable for colder cloudier areas. As the region warms up (with global warming) and experiences higher temperatures and longer sunshine hours, then its Huglin Index will go up and the grape varieties that can ripen there will change too. Diseases and pests are also likely to show changes, which growers will have to learn to cope with. Already in Germany, Esca and Black Rot appear regularly, even though 20 years ago such diseases were never seen due to winter cold. There are also more cycles of grape moth; once a rare pest, now a regular occurrence. Downy Mildew seems to be the only disease showing a decline. Warm and wet weather will be the worst combination for disease problems. It is clear that global warming trends are already having an effect on both the style and quality of the wines we drink. If trends continue, grape growers (and wine drinkers) will need to rethink a lot of what they currently take for granted.